I'm glad we switched forums right before the premiere, so we don't loose any new pics! I have had discussions about this already, and I'm just guessing here, but I would not be surprised if that was part of the thinking in making this move now. I'm very excited! Movie promotion time is awesome! YAY! Certainly, if there was a good time to make the transition to a new forum, this is it. I love your 'location'! So funny! Hi guys!!!!!! Let start the party!!! There are a few new interviews with the cast at 'Cinemanía'. They are in Spanish though, so I'll let you know about the jucier tidbits concerning R/E. Thanks!!! Yeah, Rupert is gorgeous!! I didn't know about "Wingardium Leviosa".... hmmm interesting. I've read only half of Emma's one as I couln't find the other half! Hey guys! This is awesome. Great timing indeed!! I'm glad you liked my location Vida (oh, hi too)! I was hoping I might get a laugh or two out of that! Those bits from the Cinemania interview sounds really interesting. It's nice to have a multi-lingual community to help us out with translations. YAY! Thanks. 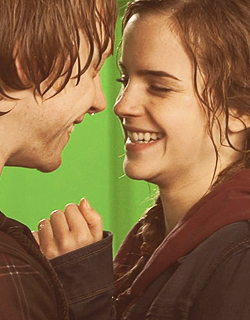 Remember too, that Emma's favorite scene in PoA is the one with her and Rupert on the Quidditch field. Gee d'ya think that maybe these two should agree to spend some more time together... I mean seeing as every favorite moment of theirs for the past 10 years has involved the other... I'm just sayin'. Edited by casualobserver, 29 October 2010 - 03:56 AM. Edited by Joy, 29 October 2010 - 04:32 AM. You might be the first person to have changed their username on the site already! Yeah, I'm going to point out every first I notice for the first couple of weeks. I aplogize in advance. I can't wait until Rupert and Emma provide a good R/Eason for the first official Squeeeee of the new forum! GUYS!!!! Hey I am so happy I saw the note vida left!! THANK YOU VIDA!!!.... I think it is the CUTEST thing that these are Rupert's favorite moments Emma said one of her favorite scenes to film was Bill and Fleur's wedding- hmmmmmm hehe R/E LOVE IS IN THE AIR!!! It's very, very interesting that both R/E are choosing scenes that they clearly filmed together as their favourites. LOVE is indeed in the air. Hmm yes where is the love icon? TSK TSK... LOL... yes I am here now and so psyched!! Agreed too!!! Off to bed yall-- so soon we will be seeing R/E WOHOO!!!! Sorry I missed you tonight cbmac, but I'm so happy to see you over here. It would not be right with out the captain of our ships! I threw a dinner. I just bought a new apartment in London. I tried to make it look really nice. I bought tons of flowers. I lit candles everywhere and everyone had place settings and I made food for everyone to come and eat and also I put together . . . I made like a book for everyone and I had silly questions like who was your first crush on the set? What was your best memory? What was your worst memory? Who was your favorite director? . . stuff like that, that's just really fun. And everyone had a piece of paper to write it all down, but we all discussed our answers and went around and listened to people's stories and what they remembered. It was just a really nostalgic evening basically, just all of us sharing stories. It was a really nice evening and it was warm weather, so we sat outside as well, and I bought disposable cameras for the tables, so everyone could use those, and it was just fun. It was just chill. Just tell me you would like to have been a fly on the wall too! Two words... HECK YEAH!!!!!!! Guys we will be getting our favorite couple soon!!! Hello all! Patrick is here!